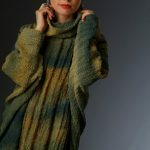 As luxurious as it is practical, this “sweater” is as dramatic or as comfy as you want it to be. 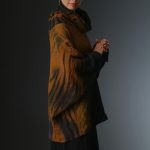 Made of puffy, stretchy Bubble Silk, it’s warm, light-weight and breathable. The Alyssa Top travels like a dream, too, since it’s lightweight and rolls up to nothing. Hand washable. 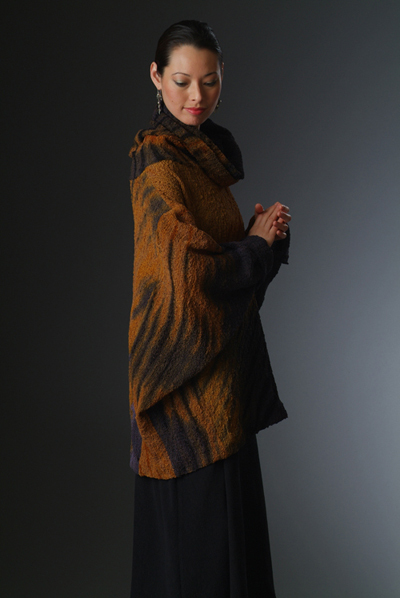 Featured: Huari Batik – Huari Shibori and Batik dyed bubble silk in dove gray and slate black. Also shown: Tiger, Tiger – Original Shibori dyed in tobacco and black; Forest – Arashi Shibori dyed in deep green and yellow ocre. Please see OBTAIN for ordering information and to inquire about lengths, sizes, colors and patterns available, either currently or by special order. 98% Silk, with 2% Spandex. To protect your investment, please see our Care Instructions.